Level 33 Entertainment recently send us over information for their upcoming release of "Copenhagen". It has received multiple film festival awards in 2014 including the Grand Jury Prize for Best Narrative Feature at the Florida Film Festival, the Grand Jury Prize for Best Feature Film at the Gasparilla International Film Festival, The Grand Jury Prize for Best Narrative Film at the Destiny City Film Festival, and the Grand Jury Prize for Best Feature Film at the Woods Hole Film Festival. The upcoming film stars Gethin Anthony (“Game of Thrones”, Aquarius), Frederikke Dahl Hansen (“Rebounce”, You and Me Forever), Sebastian Armesto (Anonymous, Pirates of the Caribbean: On Stranger Tides), Tamzin Merchant (Jane Eyre, Pride & Prejudice, “The Tudors”), and Olivia Grant (Stardust, “Crossing Lines”). 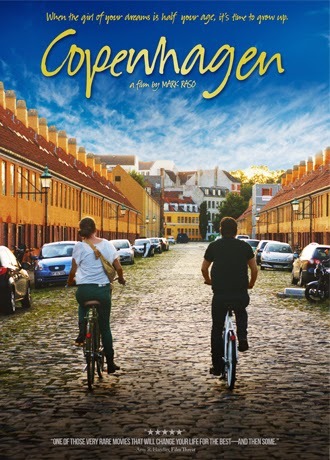 "Copenhagen" hits theaters in limited release and VOD on October 3rd. Level 33 Entertainment is proud to announce the release of COPENHAGEN, the winner of the Audience Award for Best Narrative Feature at the 2014 Slamdance Film Festival, in select theaters across North America and all On Demand platforms beginning on October 3, 2014. The romantic adventure film was written and directed by Mark Raso (Under – Gold Medal Winner: Student Academy Award®) and stars Gethin Anthony (“Game of Thrones”, Aquarius), Frederikke Dahl Hansen (“Rebounce”, You and Me Forever), Sebastian Armesto (Anonymous, Pirates of the Caribbean: On Stranger Tides), Tamzin Merchant (Jane Eyre, Pride & Prejudice, “The Tudors”), and Olivia Grant (Stardust, “Crossing Lines”). In addition to the win at Slamdance, COPENHAGEN has received multiple film festival awards in 2014 including the Grand Jury Prize for Best Narrative Feature at the Florida Film Festival, the Grand Jury Prize for Best Feature Film at the Gasparilla International Film Festival, The Grand Jury Prize for Best Narrative Film at the Destiny City Film Festival, and the Grand Jury Prize for Best Feature Film at the Woods Hole Film Festival. The film was produced by Mauro Mueller, Mette Thygesen, and David Figueroa Garcia. COPENHAGEN will be playing exclusively in select theaters including the Village East Cinema in New York City and the Laemmle NoHo 7 in Los Angeles beginning on Friday, October 3, 2014. The film will also be available On Demand from all major providers including InDemand, DirecTV, Vubiquity, iTunes and Amazon Instant. Writer/director, Mark Raso and star Gethin Anthony will appear in person on both Friday, October 3rd and Saturday, October 4th at the Laemmle NoHo 7 in Los Angeles for a Q&A directly following the 7:10pm showing. Producer, David Figueroa Garcia will appear in person for a Q&A on Friday, October 3rd at the Village East Cinema in New York after the 7:30pm show. COPENHAGEN centers on the immature William (Gethin Anthony, “Game of Thrones”) who, after weeks of traveling through Europe, finds himself at a crossroads in Copenhagen. Not just another European city, Copenhagen is also the birthplace of his father. When William meets pretty local girl Effy (Frederikke Dahl Hansen), they set off on an adventure to find his grandfather. Effy's mix of youthful exuberance and wisdom challenges William like no woman ever has. As the attraction builds and William finds himself truly connecting with someone for the first time in his life, he comes to this realization: if the girl of your dreams is half your age, maybe it’s time to grow up.